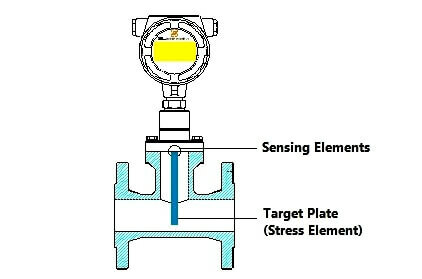 Target flowmeters, also known as drag force flowmeters, insert a target (drag element), usually a flat disc or a sphere with an extension rod, into the flow field. They then measure the drag force on the inserted target and convert it to the flow velocity. Target flowmeters measure flow by measuring the amount of force exerted by the flowing fluid on a target suspended in the flow stream. The force exerted on the target by the flow is proportional to the pressure drop across the target. Similar to differential pressure flowmeters, Bernoulli’s equation states that the pressure drop across the target (and hence the force exerted on the target) is proportional to the square of the flow rate. One major advantage of the target flowmeter over other flowmeters is, with a sphere drag element, a proper strain gage layout, and well thought-out mathematical formulas, a target flowmeter is capable of measuring sporadic and multi-directional flows. The deflection of the target and the force bar is measured in the instrument. Can be used with a wide variety of fluids, even viscous fluids and slurries. 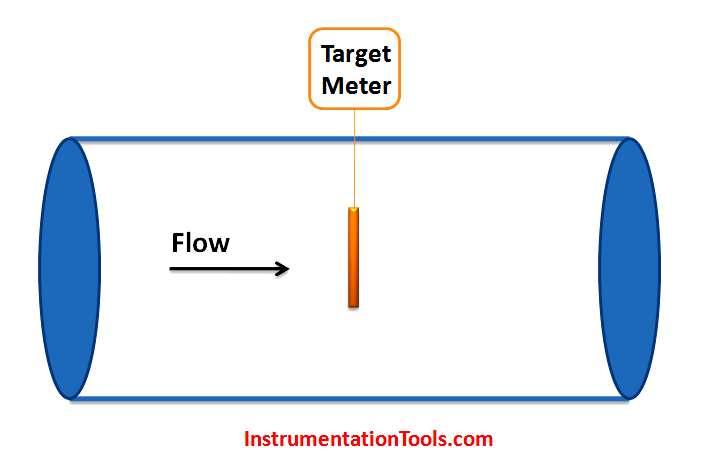 What is a Velocity-based Flowmeter ? What is a Variable Area flowmeter ? Why Flow Directly Proportional to Square Root of ΔP ?